Featured here below are a collection of some of the best tiny houses we have found around the net. Examine how they are constructed. Observe the aesthetics and utilization of space. See what you think. ​Many people want to buy a tiny house nowadays to save money on a mortgage, costly utility bills, and other expenses, and to simplify their lives. In a tiny house, you can only own what you absolutely need and love. No unnecessary things that can clutter up your life and your mind. Another aspect is you can own more land, live away from the maddening crowd, and your total cost of living is much lower. Find peace and serenity and appreciate life, family, and friends even more. Whether you are looking for a tiny shed, a tiny cabin, or a tiny house, you'll find the best tiny houses structures, decorations, furniture, appliances, and decor here to complete your tiny house. ​ We offer the best selection of tiny house products and information than any other website online. For one thing they are less expensive, and definitely cheaper to take care of as far as repairs and monthly bills are concerned. If you are looking striving to live a sustainable life, then tiny house living might be a solution for you. Designers have found pretty creative ways to make the small spaces work well, too, and on top of that, a tiny house is pretty doggone cute! What Are My Options in Tiny Houses? You can buy a tiny house already made and ready to go. You simply have to have land to put it on. You can pick from some basic floor plans and change a few details as desired, then the builders can create your own personal tiny home. You can buy tiny house plans, and build your own. We've even see people build tiny houses from old school buses, campers, and more. Choose a stationary house, or one on wheels, so you can take home with you everywhere you go. What is the Typical Size of a Tiny House? Tiny houses normally don't exceed 550 square feet. Smaller "toy box" houses might be 120-140 square feet. Your average tiny house is probably between 170-300 square feet. Choose the size based on your family size, and the accommodations that you perceive you might need. Consider a larger tiny house if you have pets, so that they will have ample room to run and play. If you travel a lot, and you want to tow your house along with you, then there are maximum sizes that can be towed, so you'll need a smaller house. The typical tiny house on wheels is usually less than 8 ft by 20 ft, with livable space totalling 120 square feet or less, for ease of towing and to exempt it from the need for a building permit. 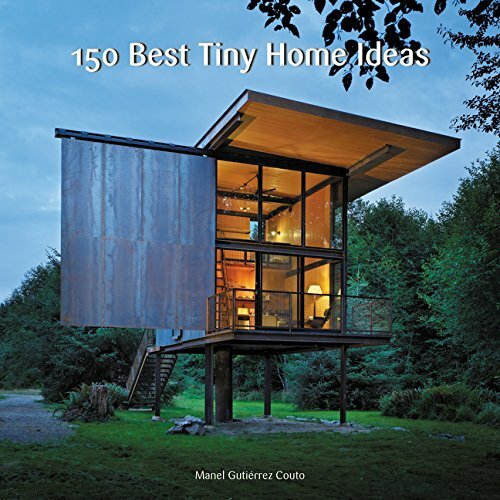 ​A lavish, full-color guidebook showcasing the most up-to-date innovations and latest trends in efficient and successful small space design. Disclosure: We are a website that receives compensation from the companies whose products we feature. We are independently owned and the opinions expressed here are our own.